Long Islanders headed for a Memorial Day weekend trip should have mostly clear weather for their departure, but could be greeted by a shower or thundershowers when they return Monday or Tuesday. 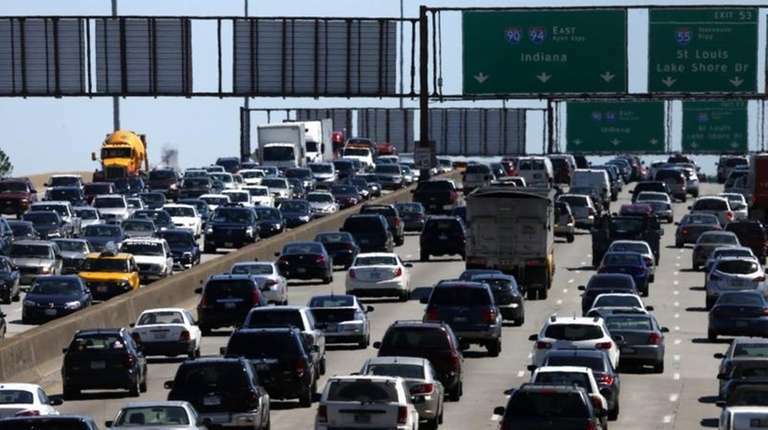 They are also likely to have a lot of company on the road, on the rails and in the air as an estimated 37.2 million Americans plan a trip of at least 50 miles this weekend, the highest volume for this holiday in a decade, according to a survey by AAA, the auto club. Travelers may be motivated by lower gas prices and a tough winter, or might be among the increasing number of people who have been buying new cars recently and want to give them a holiday test drive, according to AAA New York spokesman Robert Sinclair Jr.
"AAA is expecting more travelers this year than anytime [in] the past 10 years, with 89 percent driving," Sinclair said. The price of a gallon of gasoline on Long Island ranges from $2.69 to $3.05, according to several websites that track prices. That's about $1 per gallon less than a year ago. To speed motorists on and off the Island, the New York State Department of Transportation said it would halt all but emergency road work between Friday afternoon and Monday night. That should make it easier for Five Towns residents to depart via the half-mile-long Nassau Expressway loop now being renovated between Burnside Avenue and Rockaway Turnpike -- and for Long Island-bound visitors to get to Long Beach and the Five Towns area. The Port Authority said it expected some 5 million people to use its airports, bridges and the PATH rail system between New York and New Jersey. The Port Authority said it will have 350 customer-service workers at its airports to guide an estimated 1.6 million passengers this weekend, up 2.2 percent from the same weekend last year. Nationally, a lobbying group for the airline industry, Airlines for America, predicts planes will carry a record 222 million passengers this summer, topping a record of 217.6 million in 2007, just before the recession. The Port Authority also said it will suspend construction work at tunnels and bridges, and Port Authority police will operate a DWI checkpoint at an unspecified Hudson River crossing Friday night into Saturday morning. Saturday and Sunday should be sunny, with a high temperature of 73 on Sunday, according to Tim Morrin, a meteorologist at the National Weather Service in Upton. "It does appear at this time there is a chance of showers moving in on Memorial Day, but it does not appear it will be a washout," Morrin said. He said the chance of rain Monday and Tuesday was about 30 percent. Events will also highlight the serious side of the holiday weekend. An estimated 7,000 volunteers will stake small American flags Monday at 280,000 burial spots for American veterans at Long Island National Cemetery, Pinelawn. The U.S. Air Force Thunderbirds and the U.S. Army Golden Knights will perform at the Bethpage Air Show at Jones Beach Saturday and Sunday afternoon. The Long Island Rail Road said it will add 10 trains from Penn Station Friday afternoon. The trains will operate from Penn between 1:40 and 3:48 p.m. on the Babylon, Far Rockaway, Port Jefferson, Port Washington and Ronkonkoma branches. There will also be a 1:43 p.m. train from Penn with Jamaica connections for East End service to Montauk. That train will operate on Fridays throughout the summer season. The railroad introduced new timetables this week to reflect seasonal changes in ridership and the track work it will do this summer. Summer service changes to the East End of Long Island partially resumed May 2 with the restoration of weekend service to Greenport and an early-morning round-trip to Montauk.